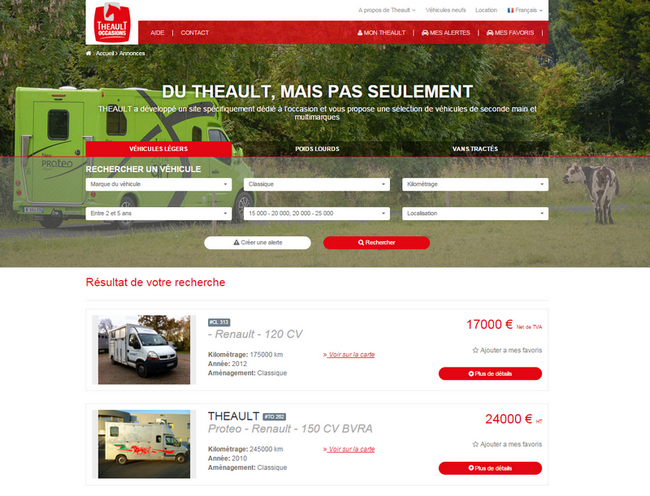 Choose your type of vehicle : horseboxes, large trucks or trailers. The form enables to select one or more criteria at the same time and is automatically adjusted depending on the available vehicles. Click on the "Search" button to view the available vehicles. The "Create an alert" button enables to save your research. When a new vehicle set online matches with your criteria, you receive an email. To subscribe to an alert, you have to create an account. Les Premium vehicles are identified thanks to a red strip. 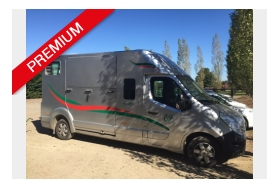 THEAULT servicing for PREMIUM VEHICLES is the guarantee of a vehicle checked by experienced professionals and a detailed check-up of allessential mechanical and body parts of the horsebox. Among the services offered by THEAULT, you may also add complemantary options such as a tie bar, sulkys racks, tow bar or even a round table with pivoting seats for 5-passenger cabin. It's even possible to arrange the tack-room at your convenience ; or to personalise your vehicle with added decorative stips or alloy wheels. The demonstration vehicles are the one we use on exhibitions and faire. They are new but haven't transported any horses, even though they may have recorder some kilometers already. Thus they are offered at interesting conditions. These vehicles are offered at attractive conditions during punctual destocking operations.